During a heart attack, clots or narrowed arteries block blood flow, harming or killing cells within the tissue. But the damage doesn't end after the crushing pain subsides. Instead, the heart's walls thin out, the organ becomes enlarged, and scar tissue forms. If nothing is done, the patient can eventually experience heart failure. But scientists now report they have developed gels that, in animal tests, can be injected into the heart to shore up weakened areas and prevent heart failure. Heart attacks strike 750,000 people each year in the U.S., according to the American Heart Association. And more than 5 million U.S. residents are living with heart failure, with symptoms that progress from fatigue and shortness of breath to eventual death. "Heart failure is a huge problem, and few therapies are available for these patients," says Jason A. Burdick, Ph.D., leader of the study. Treatments include lifestyle changes, medication, implants or heart transplants. Burdick, who is at the University of Pennsylvania (Penn), explains that these options often don't work well or, in the case of transplants, are hard to come by. So scientists are pursuing other treatment methods. For instance, researchers at other institutions have done animal studies in which they injected cells into the damaged section of the heart to try to repair damage. To prevent the cells from leaking out, those researchers embedded them in biodegradable "hydrogels"—water-swollen networks of polymer chains with a consistency similar to Jell-OTM. But the scientists noticed something odd when they ran control experiments in which they injected the hydrogel without added cells: Some of the animals' hearts still showed improvement compared with untreated animals. Based on those findings, a handful of labs are now experimenting with hydrogel treatments, including two materials that are in clinical trials. Neither is from Burdick's lab, but as he notes, "It's important we all keep moving forward to figure out how this therapy could be used, because it's different than any current treatment." In addition, different types of hydrogels could suit different patients' needs. Some experimental heart attack treatments require surgery to open up the chest, but the two hydrogel materials already in clinical trials are injected into the damaged tissue through a long catheter inserted through the skin—eliminating the need for open-chest surgery. In fact, Burdick's gel is unique among hydrogels in providing mechanical support to stabilize the damaged area. In sheep studies, this gel limits formation of scar tissue, thinning of the heart's walls and enlargement of the heart. By preserving the organ's size, the gels also reduce leakage of blood through the mitral valve. Together, these benefits maintain the heart's blood-pumping ability and could stave off heart failure. The team's materials are based on hyaluronic acid (HA), a type of sugar molecule that occurs naturally in the body. The researchers modified the HA molecules by attaching adamantane and cyclodextrin groups to allow the gels to flow through catheters, and they added thiol and methacrylate groups to enable post-injection cross-linking to stiffen the hydrogel. Once the researchers finalize the hydrogel formulation and delivery method, they hope to partner with a catheter firm to bring a product to market. Burdick's team and other research groups are also designing hydrogels that contain drugs or cells that can repair heart tissue. More information: Engineered injectable supramolecular hydrogels for myocardial applications, 252nd National Meeting & Exposition of the American Chemical Society (ACS), 2016. Heart disease is a major clinical problem and post myocardial infarction (MI), left ventricular (LV) remodeling ensues and leads to geometric changes that result in dilation and thinning of the myocardial wall. This increases stress in the infarct and healthy tissue and can ultimately result in heart failure. Injectable biomaterials are being investigated to address this clinical problem, including to alter stresses in the infarct region when injected and to deliver biologics, such as stem cells and biomolecules. My laboratory is interested in a class of hydrogels based on the molecule hyaluronic acid (HA) and we have synthesized variations of HA macromers that form hydrogels with a range of mechanical properties and degradation (from a few weeks to stable over many months). This tunability in properties allows us to investigate how material properties (e.g., mechanics and degradation) influence the ability of injectable HA hydrogels to alter stress profiles and LV remodeling and to deliver therapeutic molecules (e.g., TIMP-3, to alter matrix remodeling within infarcts). 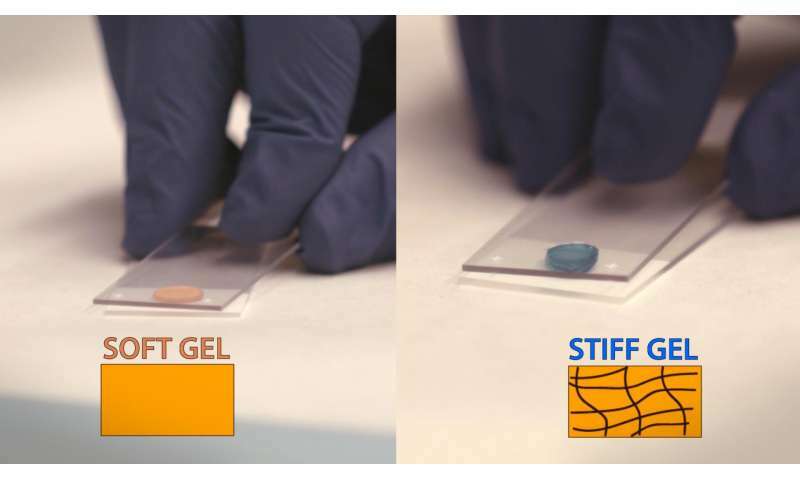 Most recently, we have designed a class of shear-thinning and self-assembling hydrogels that can be used for the delivery of mechanical signals, as well as cells and therapeutics. Ultimately, these iterations on material design are teaching us what important signals are needed in these hydrogels towards the next generation of translatable therapeutics for cardiac repair.